It’s important that I explain why I was watching this series. You see, thanks to an abundance of free time at the moment I actually find myself running a little short on things to watch. I’ve also just got a new book of Killer Sodukus and need something fairly innocuous to put on while I’m working my way through that . 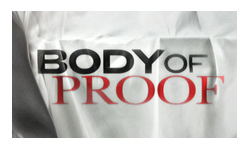 One evening, after clearing off my Sky+ backlog, I went rummaging around on the Lovefilm Instant service to see what I can find and stumbled over Body of Proof. I went back and had a look at my pilot review and noted that although I wasn’t enthused enough to seek it out at the time, I thought it might be ok. On top of all that, the first season is only 9 episodes long, so it wasn’t exactly a huge commitment. That’s a pretty lengthy insight into my unexciting life, but it’s important that you understand that. Because even given those low ambition reasons for watching, and the fact that my brain was half occupied with soduku… it’s impressive that Body of Proof was still so deeply unsatisfying. The biggest problem with the whole thing is the quality of the mysteries. The most basic requirement of a procedural show is that the cases make sense. Yes, to be successful you need characters and originality etc, but if your cases are stupid, you are sunk before you even start. It’s not like I even need the cases to be memorable (god knows I watch enough CSI and NCIS), but the ones on Body of Proof are just plain shabby. Aside from the phenomenal reliance on our hero spotting a microscopic clue, or each victim or accused having some obscurely specific medical complaint, almost every episode had a gaping error in it. One case was immediately ruled a murder rather than a suicide because the victim had been shot in the head twice (admittedly tricky to do yourself) and then utterly failed to have that happen in the eventual flashback to the murder. Barely an episode went by when something wasn’t either dropped in the middle, or introduced unexpectedly. Everything was just so frustratingly fake. The female medical examiners are always in form fitting designer dresses and ludicrously high heals, no matter where the body is. One of the flunkies is a borderline offensive parody of a self-righteous black woman (although he’s male) doing the whole “oh no you di’nt just go there!”, while the other is the usual tedious caricature geek with glasses and awkwardness. The detectives are two good actors (Sonja Sohn of The Wire and John Carroll Lynch of ‘you’ll know him when you see him’) doing their best with the clichés they’ve been given, but even their attempts to deliver subtlety and humour with body language and delivery cannot completely overcome the terrible dialogue. I guess I should comment on Dana Delany as it’s really her show, but I don’t really know what to say, because talented though she is, she can’t fight her way through the fact that this show just isn’t very good. I came to like the stuff with her daughter and when she got a chance to play human, but the rest of the time the character she was too much of a superhero, a medical examiner who can see the tiniest details and identify fungus at just a single glance. Even as something that I only wanted to pay attention to with half my brain, it still managed to be unsatisfying. The actors deserve better. My soduku book deserved better. It will take a special kind of boredom to make me watch season 2. Depending on the growth of hair the eyelash extension may lasts from about two weeks to two months. However, you will notice that you don’t have to have trouble with false eyelashes when you can finally grow your own more time lashes. Everyone loves the opening retreat, as they open their eyes.